Presented by John Toal and Kerry McLean, the final was broadcast from the Ulster Hall, Belfast, on BBC Radio Ulster earlier today (Sunday 7 April), and recorded for a special highlights programme for BBC NI television to be shown on BBC One Northern Ireland, Sunday 14 April at 5.30pm. 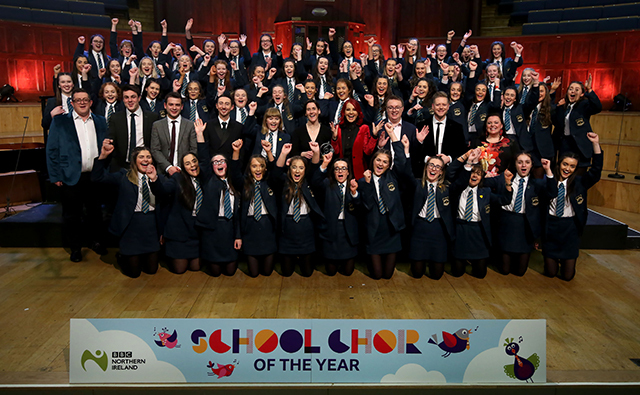 Sixty-two choirs battled it out over the course of the past eight weeks and six schools from across Northern Ireland took part in the live final, with three competing respectively in the junior and senior categories. The awards to the two schools were presented by guest judge Carrie Grant, vocal coach, singer and television presenter. The rest of the judging panel was made up of Ciaran Scullion, Head of Music, Arts Council for Northern Ireland; Richard Yarr, Senior Producer Classical Music, BBC Radio Ulster, and Andrew Nunn, Musical Director with the Ulster Youth Choir. 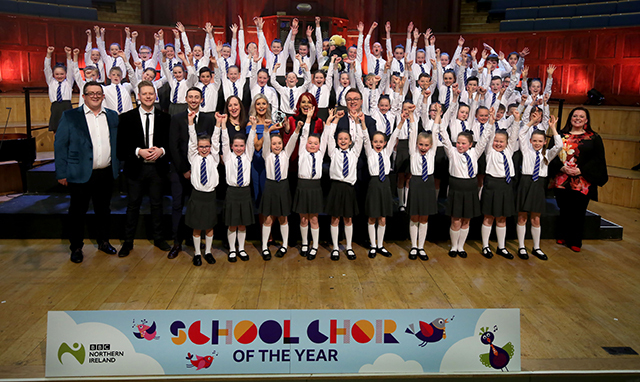 The choirs taking part in the Junior category final were: Pond Park Primary School, Lisburn; Ebrington Primary School, Londonderry, and Macosquin Primary School, Coleraine. In the Senior category competing in the final were: Carrickfergus Grammar School; Thornhill College, Derry and Dalriada School, Ballymoney. Thornhill College performed The Seal Lullaby and De Angelis, while Ebrington Primary School performed I Am A Small Part Of The World and Get On Board. In the junior category Macosquin Primary from Coleraine and Pond Park Primary School, Lisburn were runners-up, and it was Dalriada School and Carrickfergus Grammar who were runners-up in the senior category. The two-hour live radio programme also included a performance from the Ulster Youth Chamber Choir, followed by flautist Andrew Douglas, one of the recipients of the BBC NI/ACNI Young Musicians’ Platform Awards, accompanied by Ruth McGinley.